Algorithmic number theory has gradually emerged as an important and distinct field with connections to computer science and cryptography as well as other areas of mathematics. This text provides a comprehensive introduction to algorithmic number theory for beginning graduate students, written by the leading experts in the field. It includes several articles that cover the essential topics in this area, such as the fundamental algorithms of elementary number theory, lattice basis reduction, elliptic curves, algebraic number fields, and methods for factoring and primality proving. The author uses computers to explore the solutions to some problems in number theory. The emphasis is on the statement of a problem and the examination of the solutions for numbers in a selected range. Many of the problems are very hard. 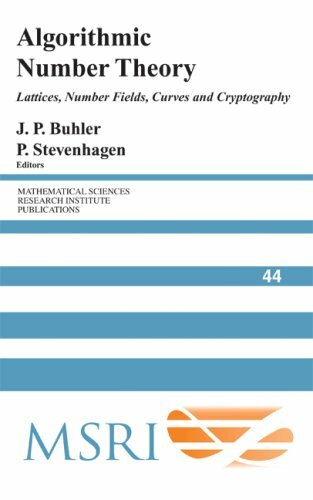 This is a book on empirical number theory concentrating on the analysis of number sequences. Its focus is on a small part of integer sequences defined by Florentin Smarandache. The author has also included some other results of his research. This book fills a significant gap in the extensive literature on classical modular forms. This is not just yet another introductory text to this theory, though it could certainly be used as such in conjunction with more traditional treatments. This introductory book emphasises algorithms and applications, such as cryptography and error correcting codes. It is accessible to a broad audience. Prerequisites are a typical undergraduate course in calculus and some experience in doing proofs.